Green propolis is a resinous substance, extracted from vegetal secretions of stalks, trunks, primitive foliar forms and sepals of flowers, and metabolized by bees. It is indicated and used in case of infections and affections of respiratory system. Infections and affections of respiratory system. 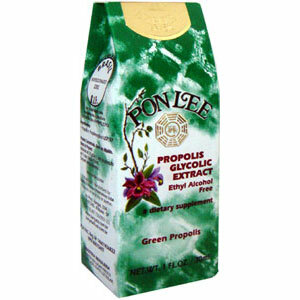 Green propolis is a resinous substance, extracted from vegetal secretions of stalks, trunks, primitive foliar forms and sepals of flowers, and metabolized by bees. It is indicated and used in case of infections and affections of respiratory system (pharyngitis, laryngitis, tonsillitis and allergic bronchitis; affections of mouth and stomach (stomatitis, gingivitis and thrush); dermatitis (chilblain, mycosis, warts and skin lesions. The transformation of this resin in glycolic solution (alcohol free) results in a nutrient complement that acts effectively in the simple pathologies caused by bacteria, fungi and viruses. Infections and affections of respiratory system (pharyngitis, laryngitis, tonsillitis and allergic bronchitis; affections of mouth and stomach (stomatitis, gingivitis and thrush); dermatitis (chilblain, mycosis, warts and skin lesions). Concentrated product; this product has to be diluted. Add 30 (thirty) drops of the extract in 1/2 (half) a glass of water. Take it properly. Do not take this product if you are allergic or sensitive to bees or bee products.